Candy Says has supplied vintage costume and accessories for various magazines, TV and film production companies and publishers such as the wonderful Millers Antiques and Collectables Guides, Judith Miller 'Shoes' book, X-Men: First Class movie, The Producers national tour (Spring 2015), Eastenders, Holby City and many more. Our most recent TV appearance was with DJ Steve Lamacq on BBC One's Living in '66 series, aired on 1st June 2016. For press enquiries please contact dawn@candysays.co.uk or call 01277 212134. We can provide high resolution images of any in-stock items on demand and also have a large archive of ready-to-email high resolution pictures of other colourful vintage items from our stock over the years, so don't hesitate to get in touch if you are searching for a particular item for your feature. Here is a collection of our press clippings and articles from such fabulous publications as Vintage Life magazine, Artrocker, Grazia, Look Magazine, You Magazine, The Independent, Celebs on Sunday, The Daily Mail, The London Paper, London Lite, The Antiques Trade Gazette and more! 'Pop, Pirates and Postmen' with DJ Steve Lamacq, telling the story of teenage life in the east of England during the momentous year of 1966. Dawn at Candy Says provided a mocked-up 1960s fashion boutique and joined an interview for the programme. Our second feature this year in the ever-popular Vintage Life Magazine. The article featured images and beauty guide from our 1960s and 1970s photoshoot with a hippy vibe in pastel Spring colours. Hair and make-up plus beauty tips by Jenny at Betty's Rock & Rollers, photography by Ian Treherne, model Marli Norman. All clothing from Candy Says. See our blog for behind-the-scenes pictures from the shoot! Vintage Life Magazine can be purchased online or at WHSmith. 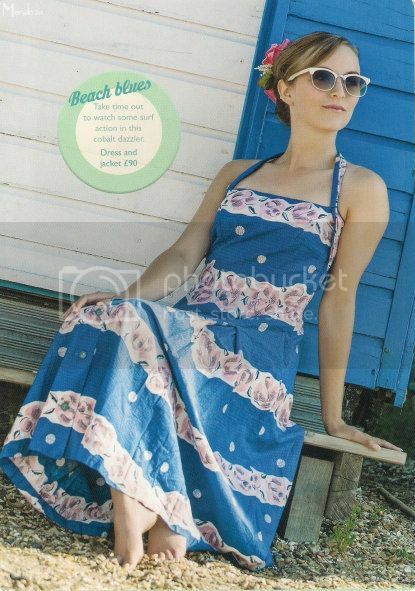 We supplied a selection of original 1950s clothing and swimwear for the 1950s summer styles' fashion photoshoot in the 2nd issue of this new Lifestyle magazine. The photoshoot was by the fabulous Terry Mendoza of Retro Photostudio, with gorgeous models Miss Lula-Mae and Tilly wearing the frocks and having a ball on the beach! See our blog for more information on the magazine and pictures from the shoot. Candy Says was delighted to be asked to supply clothing and accessories for Gill's 1970s era shop "Woo Who?" for the 1970's episode of this fabulous series. We sent a selection of mens, womens and childrens clothing and we were especially pleased to see Gill wearing a leopard print lurex top and maxi skirt supplied by us during the filming of the programme! Lots of items from our fantastic selection of vintage clothing and accessories (including six bags on the above page!) will feature in the new Millers Collectables Price Guide, due to be published in March 2010! Interview about selling vintage clothing to dealers like us! Providing valuations and purchasing vintage clothing from a local lady clearing out her clutter. We are proud to have 26 pairs of our show-stopping shoes and sandals featured in full colour in the fabulous book "Shoes" by Judith Miller of the famous Miller's Antiques and Collectables Guides! Wonderful write-up on Candy Says from renowned antiques and collectables expert Mark Hill on his blog! See http://markhillpublishing.co.uk/ for more information on Mark's latest projects.